From the Atlantic side of Central America, the Yucatan Peninsula juts north for over 200 miles into the fish-rich waters of the Gulf of Mexico. 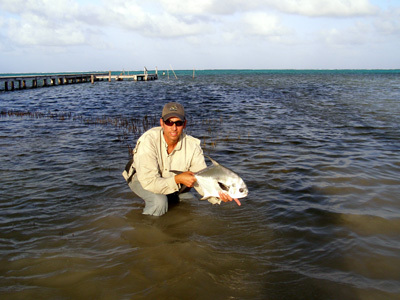 Most of the Yucatan’s angling attention is centered around Mexico’s Ascension Bay and Ambergris Cay in Belize. Many of the peninsula’s most venerable fishing lodges are located near these two areas. But near the border between these two countries, where Chetumal Bay meet the blue waters of the Caribbean, is a lesser known but just as productive, estuarine system. 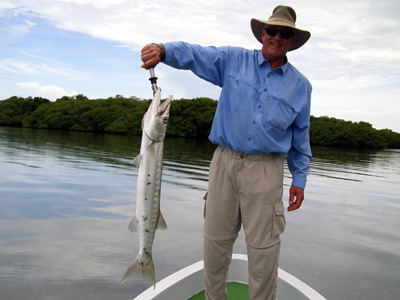 Because Chetumal Bay is too far south to be reached easily in a day from Ascension Bay, this area has been virtually ignored by the Mexican angling establishment. And while the Belizeans know full well the area’s potential, it is illegal for them to cross the border into Mexico. 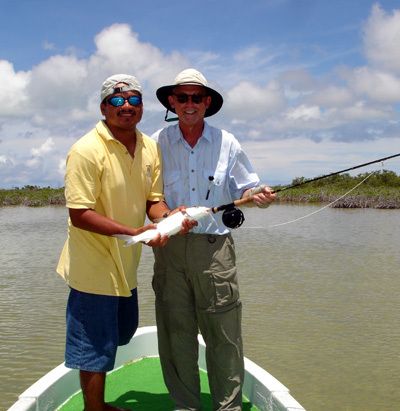 As a result of this happy coincidence of political and geographical isolation, the Chetumal Bay area has remained virtually untouched and unfished. 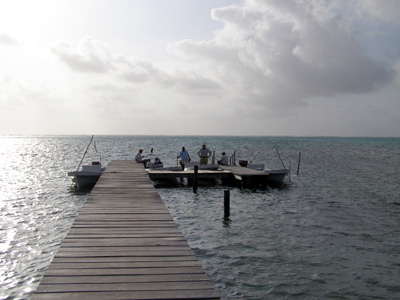 The Costa de Cocos lodge is strategically located on the peninsula between Chetumal Bay and the open Atlantic making it a perfect base for fishing these prime waters. Built on a beautiful beach two kilometers north of the small village of Xcalak (Ish-ka-lak), Costa de Cocos is located on the doorstep to a fishing paradise. In the past two years, thirty-three productive flats and lagoons have been mapped and we are continuing to explore new areas each season. 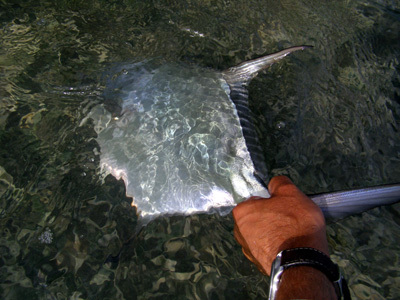 Our clients rarely see another fisherman during their time at Costa de Cocos. In order to insure the flats are not overpressured and to guarantee a solitary experience, we book only four fishermen per week. 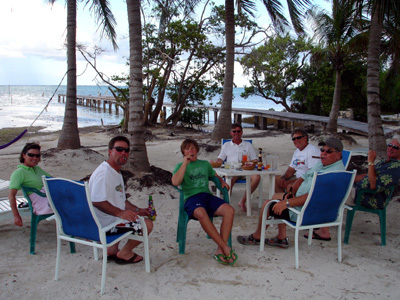 The lodge can accommodate over twenty guests, but our clients will be the only fishermen at the lodge and will, most likely, have the company of only the staff and possibly a few incidental divers. The service and attention to detail is excellent at Costa de Cocos. The guides have an extensive knowledge of their local area and they understand well the habits of the fish that prowl these waters. These guides have excellent fish spotting ability and have become experts in the needs of itinerant anglers. Two new 19’ El Pescador flats boats are moored at the lodge’s private dock for the exclusive use of these guides. 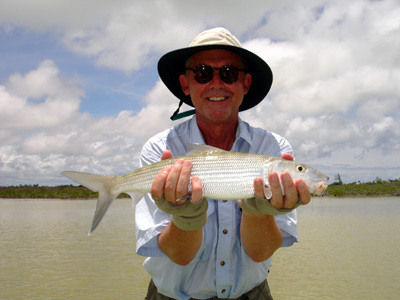 The local waters have excellent populations of bonefish found on the numerous hard and soft bottom flats. 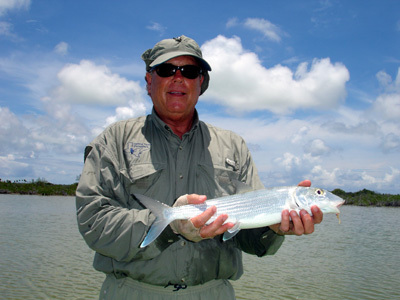 It is important to note that the area’s bonefish generally run larger than the fish you will find both north and south of Costa de Cocos. Various theories abound on the reasons for this, but this anomolie delights the seasoned angler accustomed to the smaller fish found at Ascension Bay. For the experienced angler seeking the most elusive of flat’s inhabitants, permit are found in the bay and at the lagoon mouths. These fish sometimes school in numbers of five to twenty. The larger permit feed both in the turtlegrass flats along the ocean front on an incoming tide and in Chetumal Bay, often in the morning. We suggest the months of May, June, and July for fishermen specifically targeting the bigger permit. Smaller school permit are present throughout the season. 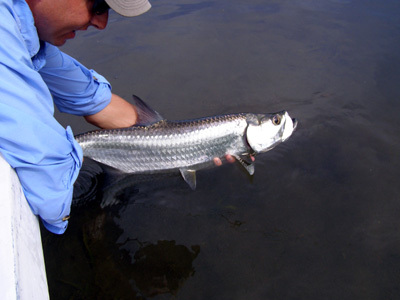 For baby tarpon, you can cast to mangrove edges in 6 to 10 feet of water or fish the flats and shallower lagoons for larger fish. Anglers are housed in individual cabanas constructed of native stone and hardwoods. These spacious rooms have two double beds and a private bath with hot shower... perfect for two fishermen. Single occupancy requests can also be accommodated. Three meals per day are included in your package. Breakfast is generally light, but special requests for hardier appetites will be accommodated. Lunch is almost always on the flats, taken on the run between casts. 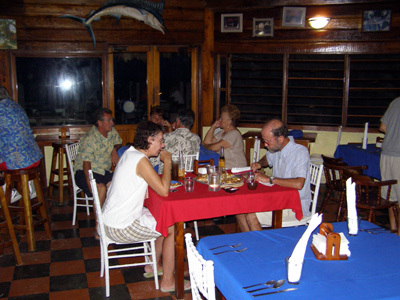 Gourmet dinners are served family-style and include a full range of seafood, local fare, and more traditional foods. 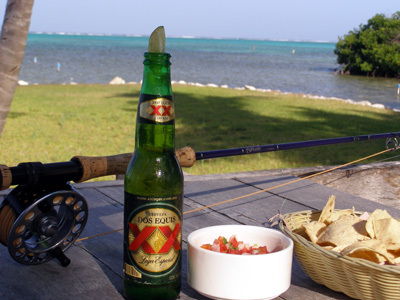 If you take a break from fishing, the snorkeling is excellent right off the dock. 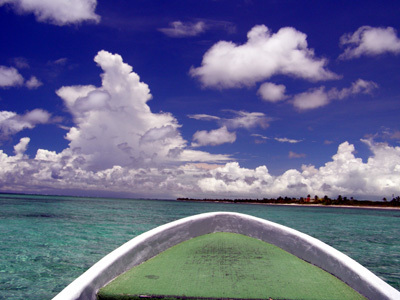 Diving, including full day excursions to Banco Chinchorro, can be arranged though the on-site dive shop. This area is well known for its varied and plentiful marine life and sea kayaks are available for exploring the nearby lagoons and rivers. 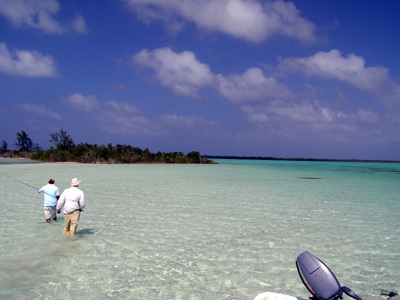 At your request, we can arrange ruins exploration through Rancho Encantado at Laguna Bacalar. This overnight excursion offers the best of the best in exploring ruins on the Yucatan Peninsula. 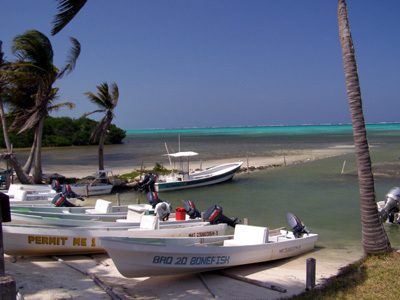 The quickest way to arrive in Xcalak from the U. S. is to fly to Belize City and take an air taxi to San Pedro on Ambergris Cay. Here you will be picked up by boat for a one hour ride back to the lodge. Shorter or longer visits can be arranged with Costa de Cocos. Please consult with us for a price quote.